Welcome! We know there's a reason you're here, and AMS Vans is honored to be part of your world. We hope you'll visit our wheelchair blog often, because we promise to bring you an engaging perspective every day. A physical disability presents unique challenges for the individual, the family and the caregivers. Our wheelchair blog is here to empower all of you with tips, trends in wheelchair technology, wheelchair news, inspiring stories, insightful interviews, medical breakthroughs, helpful links, the latest in adaptive products, disability news, upcoming events and, of course, information about AMS Vans' wheelchair accessible vehicles. We focus on anything and everything that enriches your life and makes it easier. Buying a handicap accessible van is a defining moment in the life of an individual who wants manageable mobility beyond the wheelchair. 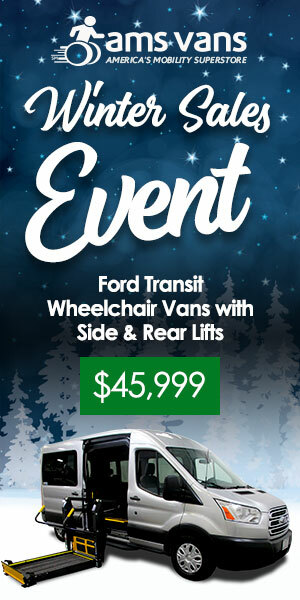 We have handicap vans for sale, and we want to ensure the process—from the moment it begins—is as smooth as possible. When you purchase a wheelchair van from us, the process never truly ends, because you become part of the AMS family. Just like family, we stay in touch and care about your happiness. We'd love to hear from you—even if it's just to say "hello!" Your thoughts matter, so take time to comment on the articles that interest you, inspire you, or provoke you. Every question, suggestion or concern you share with us helps us make our wheelchair blog better and more useful for all our readers. At AMS Vans, we want to get to know you, and we want you to get to know us! When 12-year-old Alexander Knoll saw a man in a wheelchair struggle to get through a heavy door in his hometown of Post Falls, Idaho, he was struck with an ingenious idea. What if there were an app or website that could communicate to persons with disabilities which stores in the area had automatic doors? And from that simple consideration, an adaptable solution was born. The young entrepreneur went to work, developing the Ability App — a free accessibility application akin to Yelp which helps people with disabilities navigate public spaces by providing information about wheelchair ramps, disabled parking, braille menus and more. One visit to the Ellen DeGeneres show and a check from Shutterfly for $25,000 later, Alex’s idea is on its way to completion. Sometimes the most powerful way to find the motivation you need to get over life’s hurdles is to learn about others who have overcome incredible odds to find success. It doesn’t even have to be someone in your profession or someone with the same goals that you have. Because in the end, we all face the same variety of challenges in one form or another — presence of fear, lack of opportunity, physical or mental health limitations, financial setbacks — and we’re all trying to find a way to beat the odds. If you haven’t been keeping up with the latest advances in research for solutions to enhance the lives of those with physical disabilities, you might be surprised at what’s become possible. From improvements in prosthetic options to advancements in employment psychology, let’s run down the list of how science is working to enhance the lives of this unique community. One of the more popular and effective ways that AMS Vans customers help finance a new wheelchair accessible van (WAV) when it’s time to upgrade is to sell their old vehicle. We pride ourselves on providing multiple options for financing a WAV that other dealers don’t — including a willingness to buy-back your current van. You heard us right — and, there’s no catch and no strings attached. We’re prepared to make you a firm, fair offer on your used wheelchair accessible van and put that money towards the WAV of your dreams. As the largest wheelchair accessible vehicle manufacturer and mobility dealer in the Southeast, we’re your one-stop mobility provider — including buying your old Braun Entervan.